Our sand and water unit has been a great success! 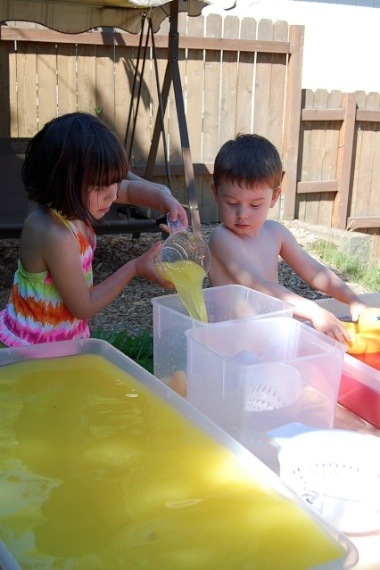 I believe the children would never tire of these activities. 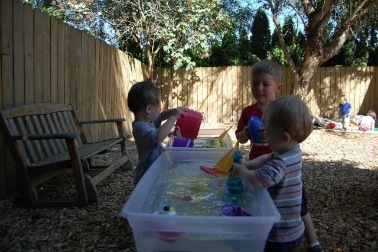 As they continue to explore they find new things to do with the sand and water everyday. 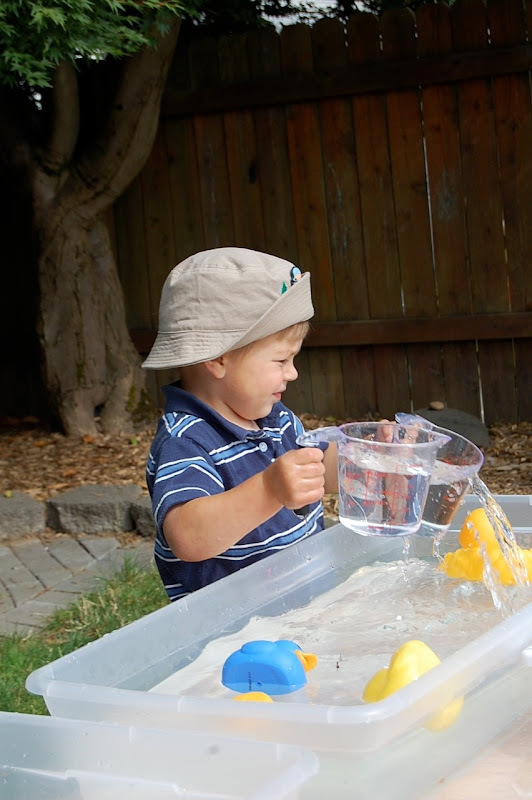 Today one little boy decided to shovel the moon sand into a bucket of water. 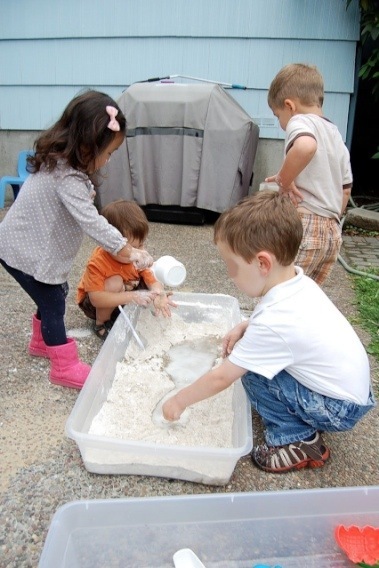 The children began to notice that the sand settled on the bottom and the cornstarch made the water turn a milky color. 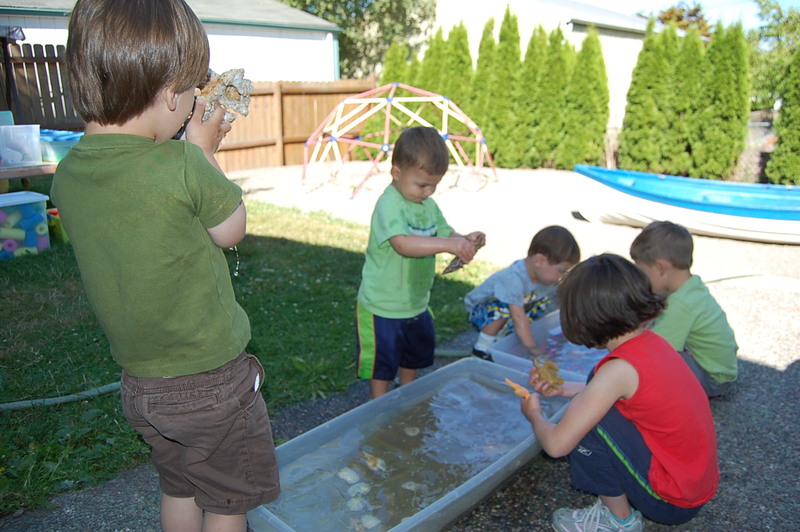 Other children began to join in and it became a very focused group endeavor to fill the bucket and watch the layers grow. 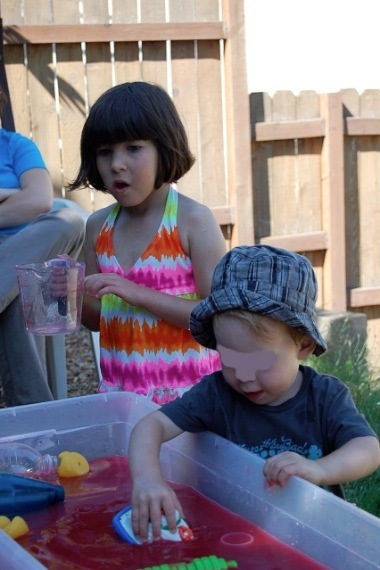 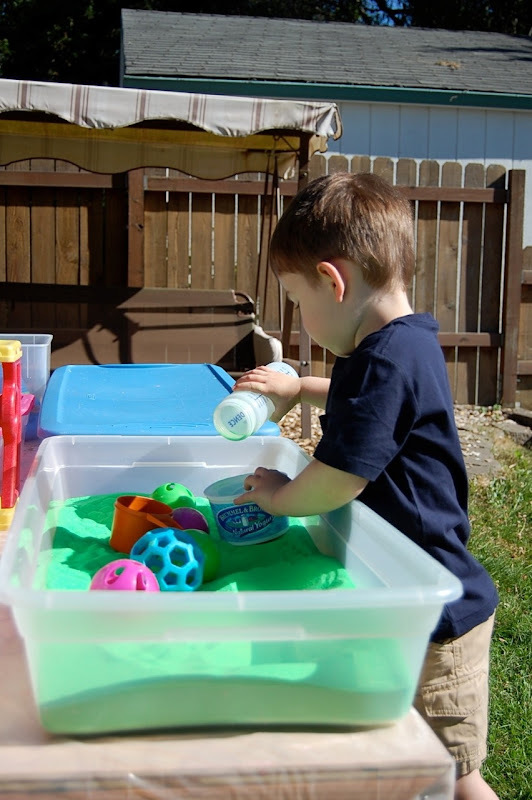 The children decided to add colored sand to the bucket which meant they had to carefully carry the sand from the activity table to the bucket on the patio thus practicing fine motor skills. The kids were very proud of their accomplishment! The project turned out to be a great impromptu science experiment where the children practiced observation and fine motor skills as well as teamwork. 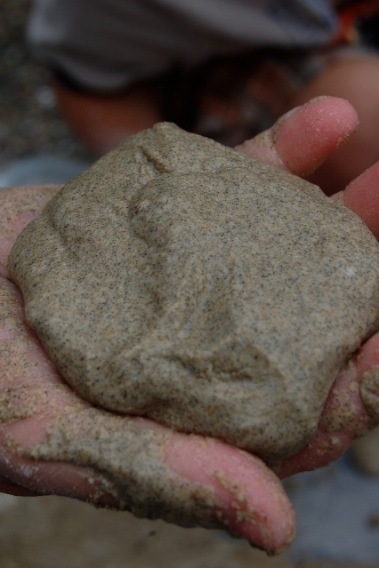 Our sand exploration continued today as the children made moon sand. 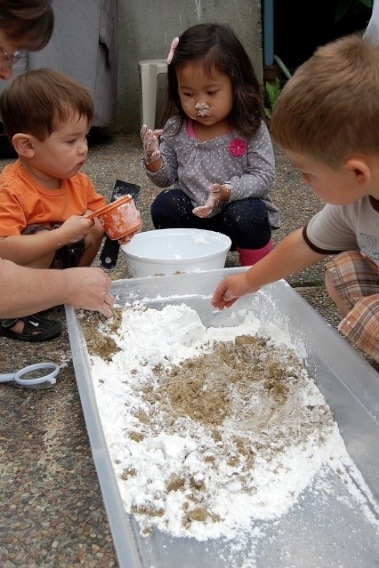 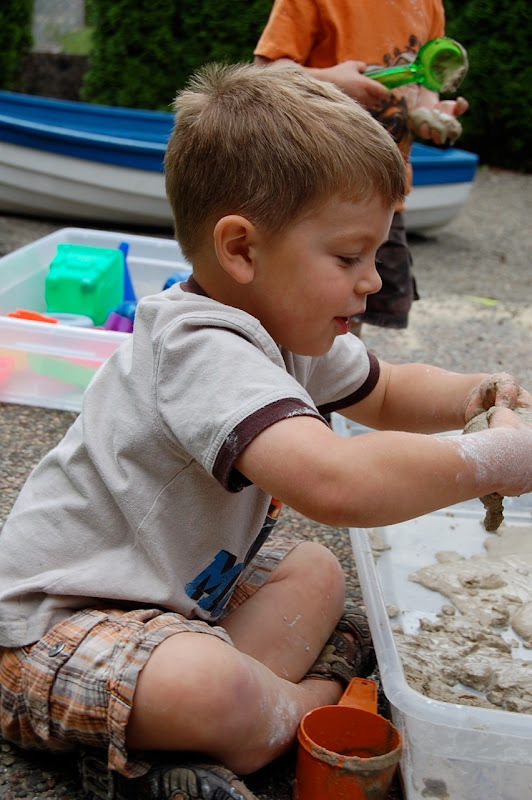 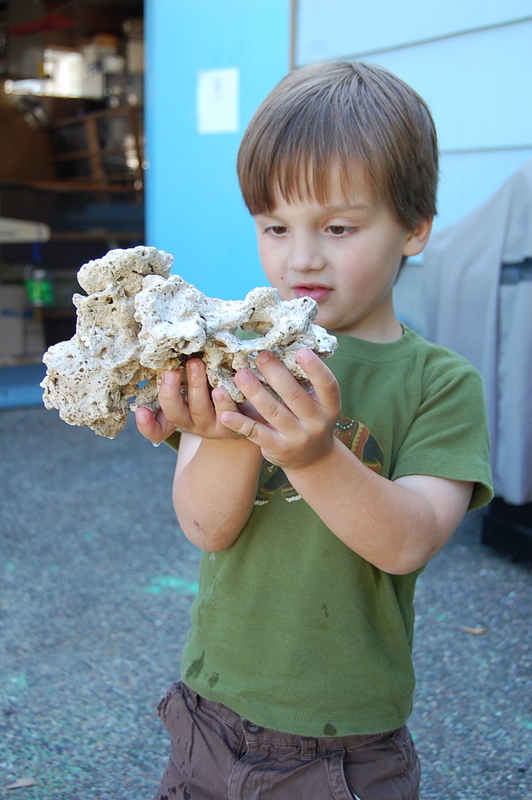 Moon sand is quite expensive and cost prohibitive to purchase in bulk for the preschool. 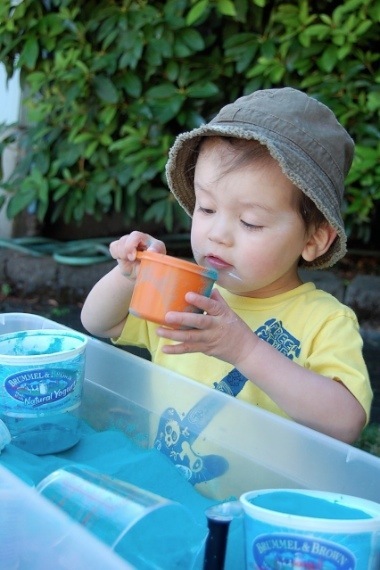 There are many recipes on the internet for making it so we gave it a try. The first step was to measure 16 cupfuls of beach sand and pour it into the tub. 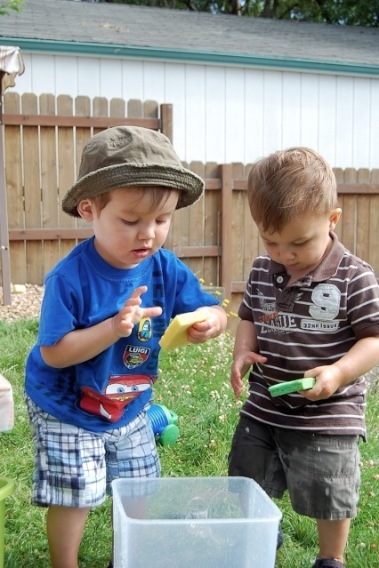 We practiced counting in Chinese at the same time. 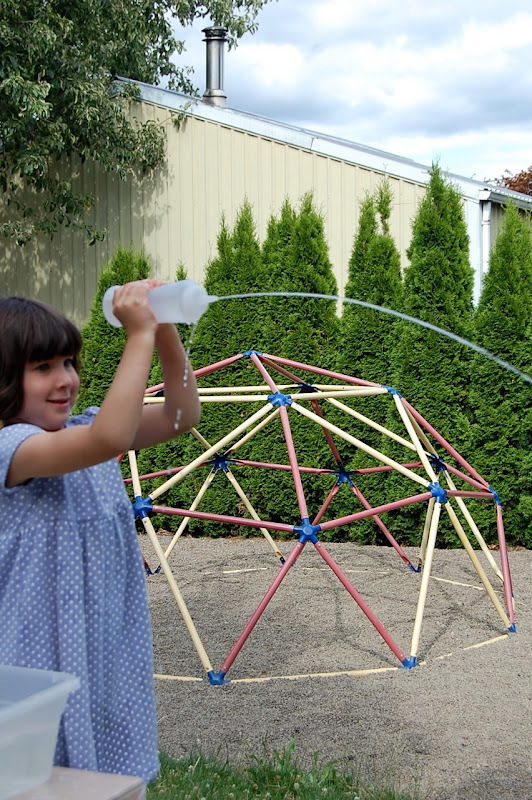 Learning to measure had its challenges but we’ll get lots more practice with that skill this year as we explore all of our science themes. Next 8 cups of cornstarch were added to the sand. 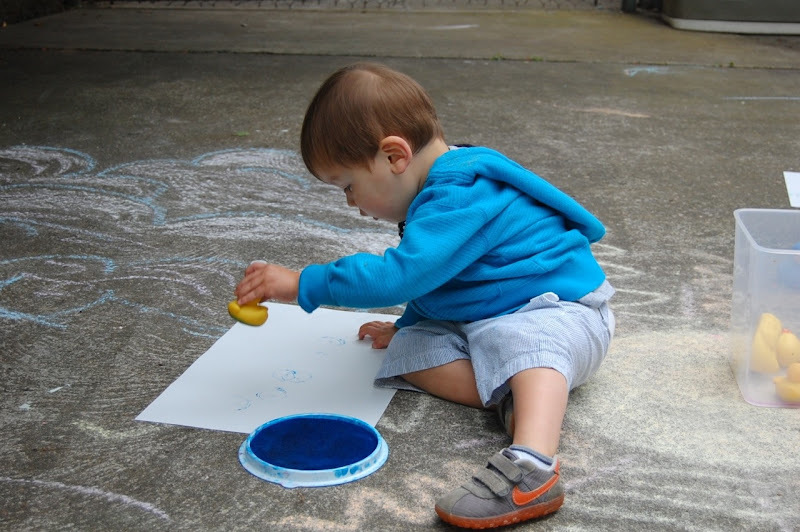 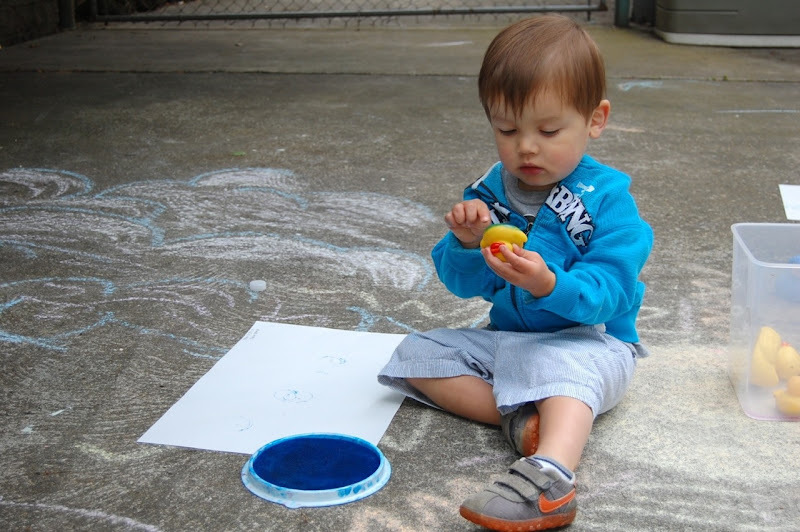 The soft powdery feel of cornstarch provides a great sensory experience for the kids. The children mixed the sand and cornstarch. 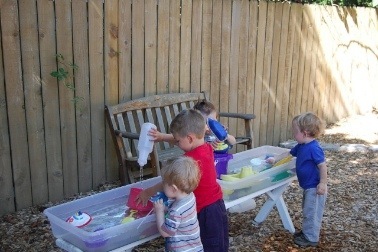 The kids added 4 cups of water to the mix. 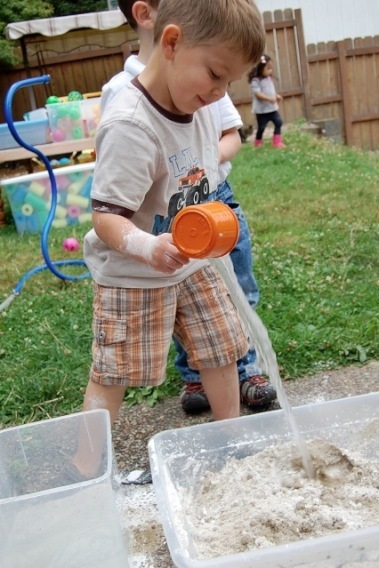 The best part was mixing all the ingredients together! 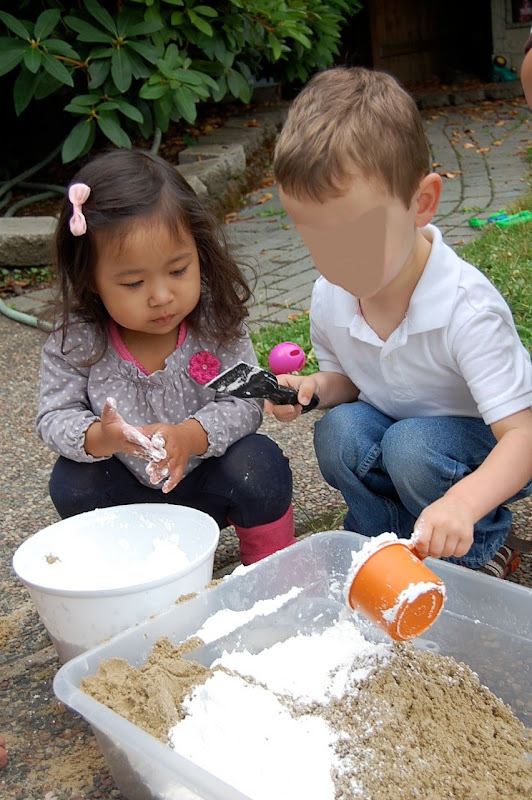 Everyone enjoyed molding the moon sand. 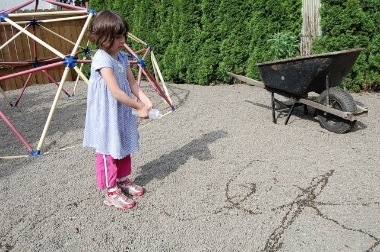 Getting the right consistency was a challenge. 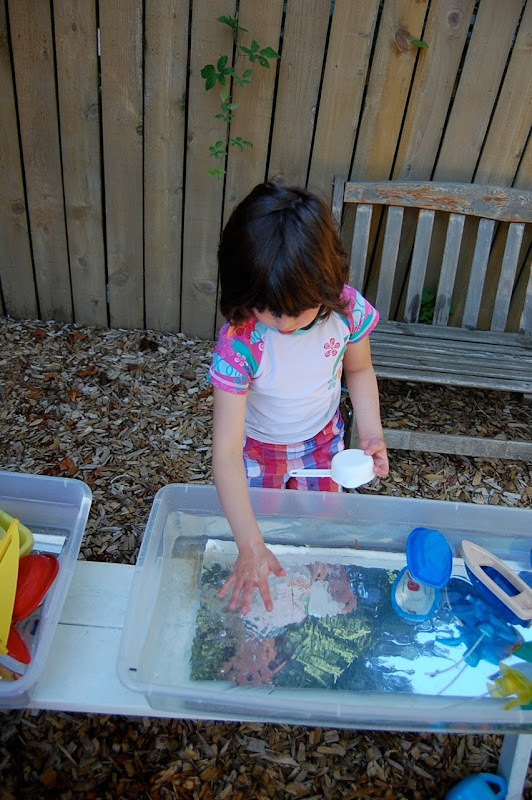 This is a bit too wet still, but as the water evaporated some it became more moldable. 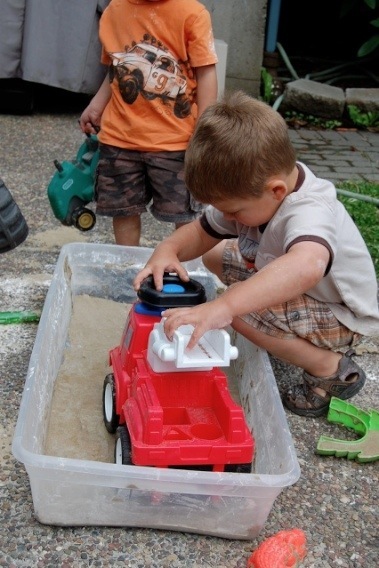 The boys began putting trucks in the sand to see what would happen. 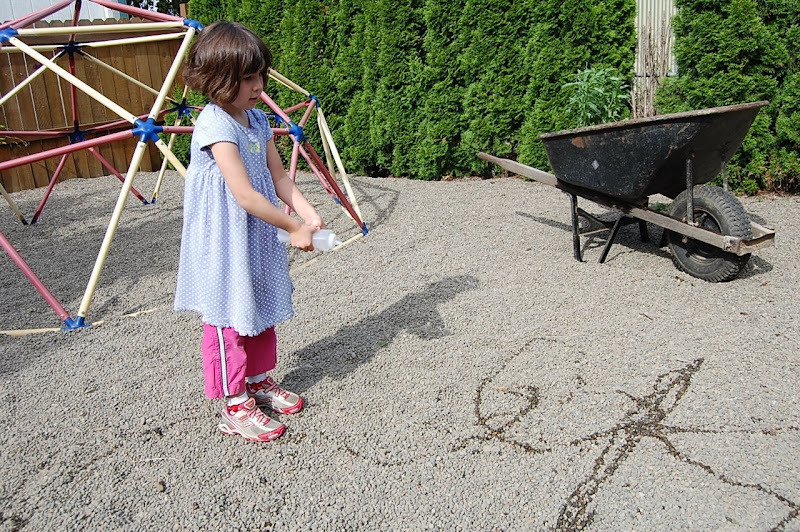 They found that the tires make prints in the sand. 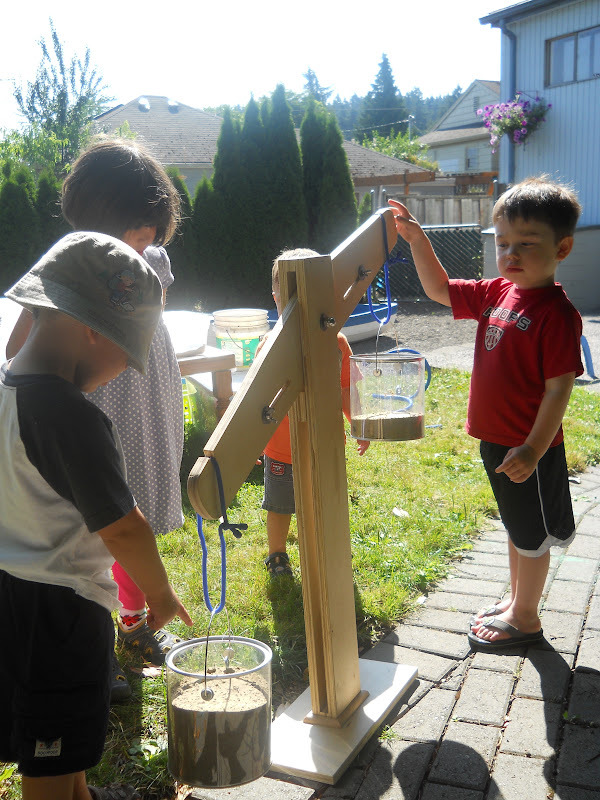 Look at our Giant Balance! 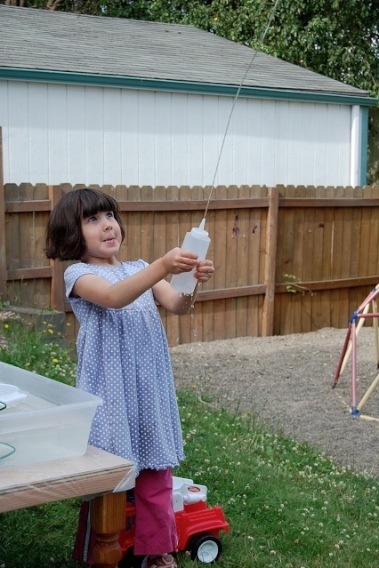 Kerry has spent the last couple weeks building this giant balance that I saw on the internet and just had to have for this year’s science projects. 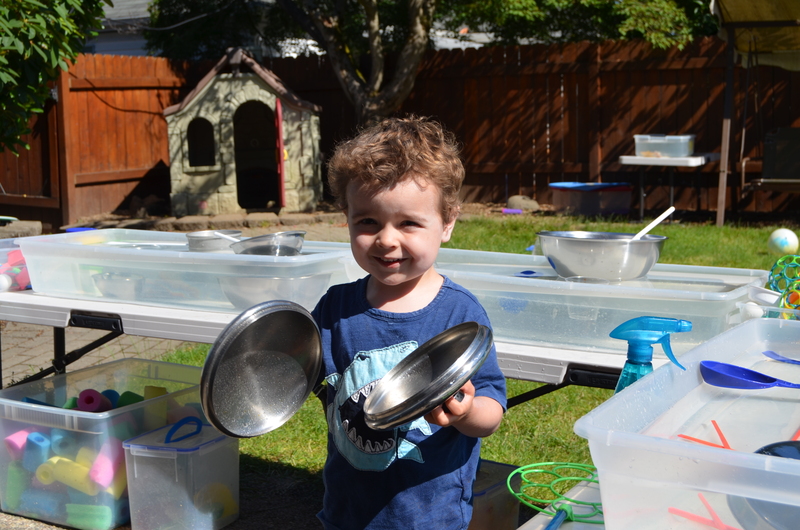 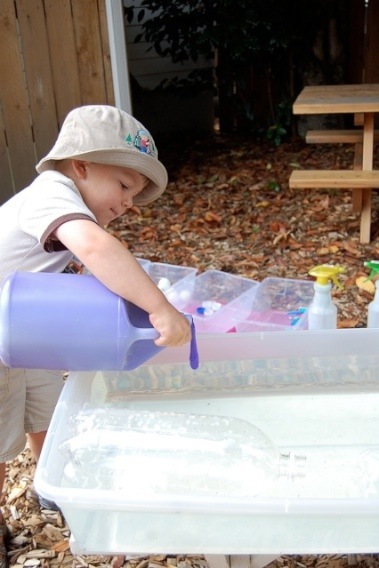 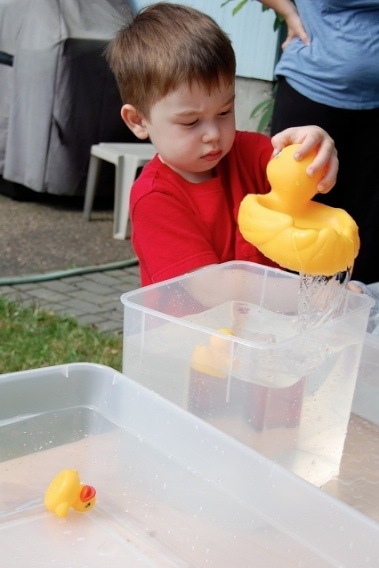 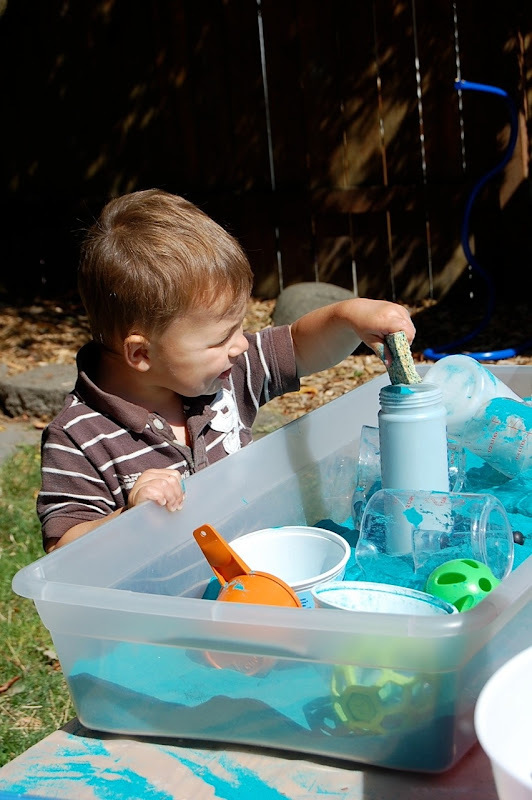 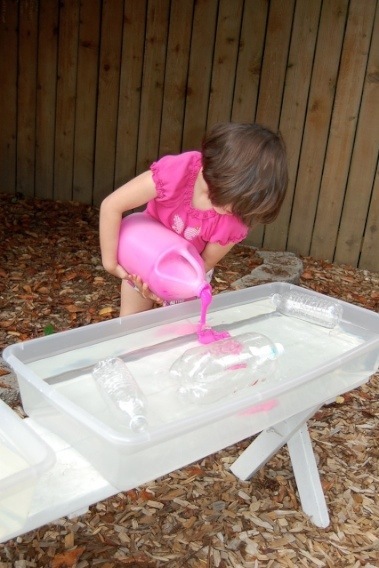 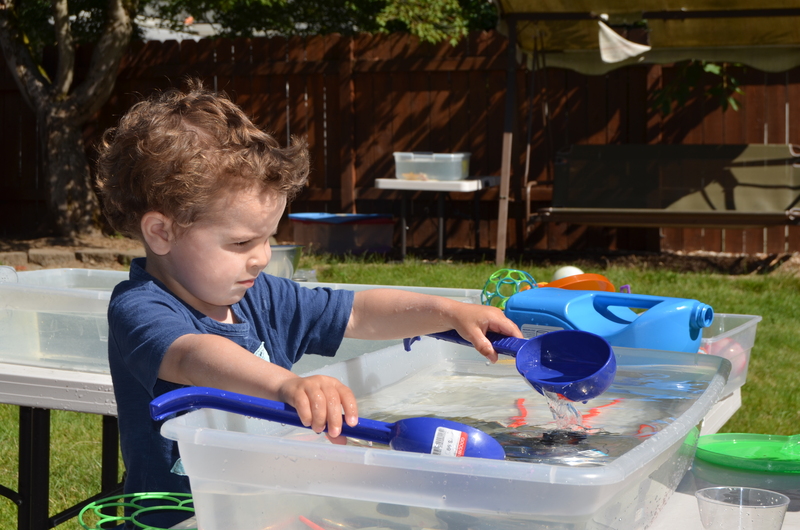 It’s the perfect toy for our outdoor water and sand table. 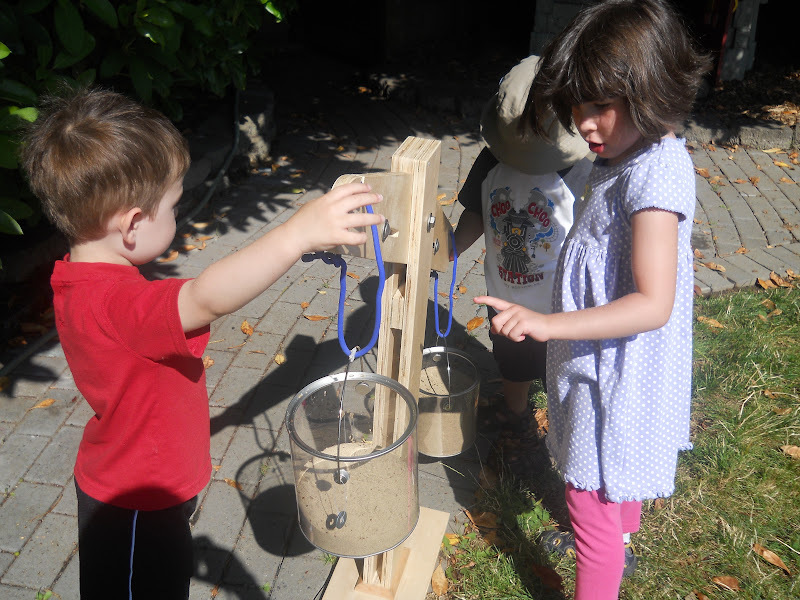 Today the kids just experimented with the balance and weighed different amounts of sand. 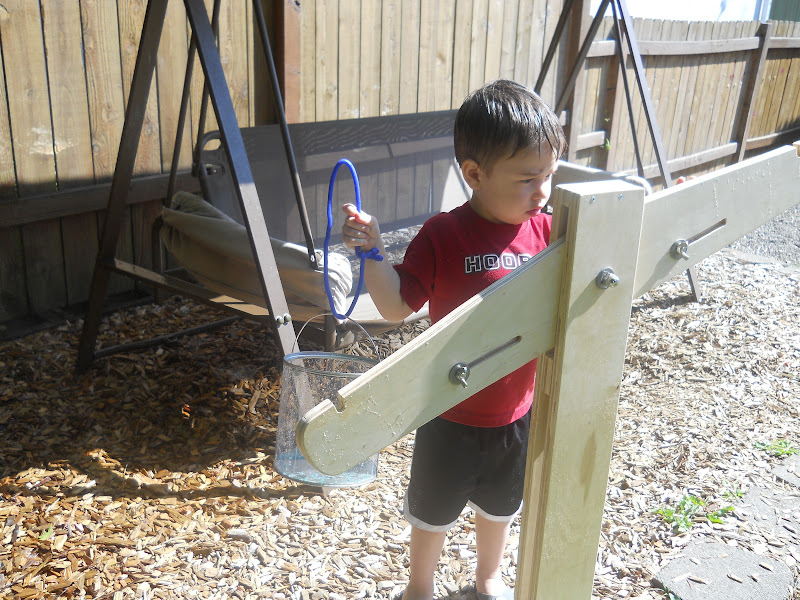 Water was the next obvious choice to try out on the balance. 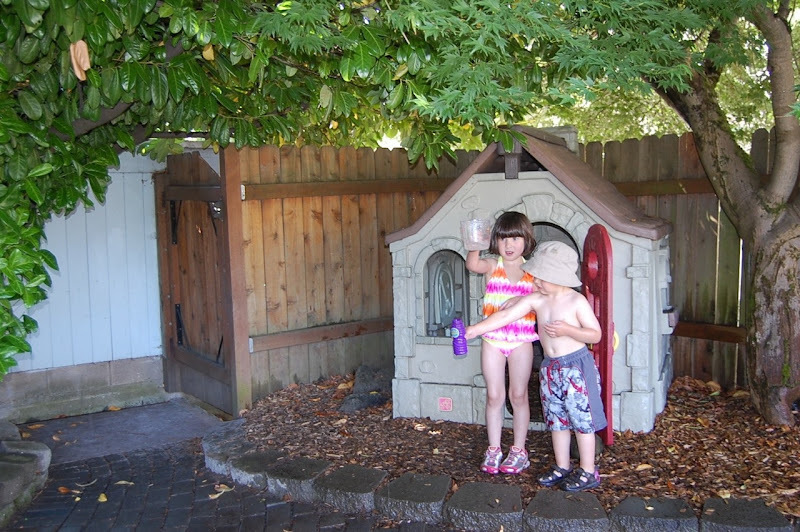 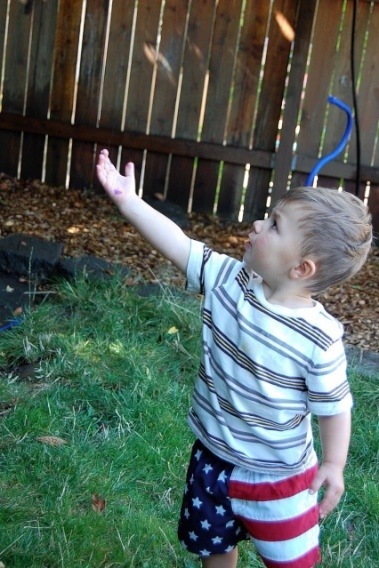 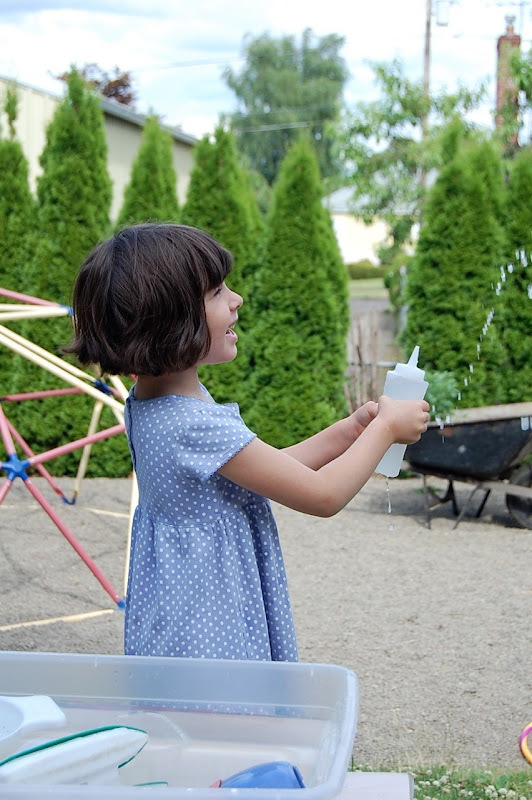 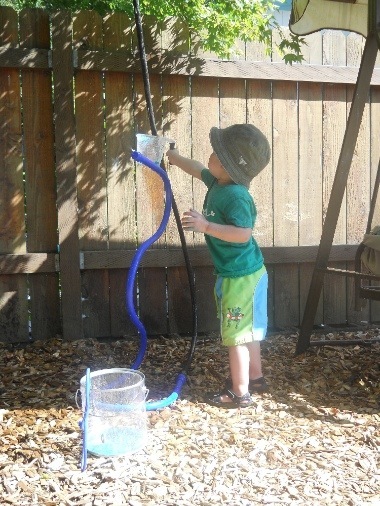 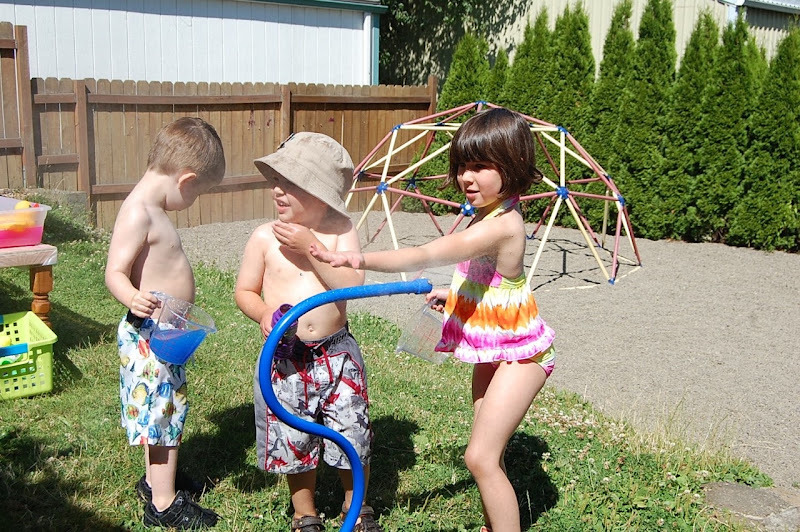 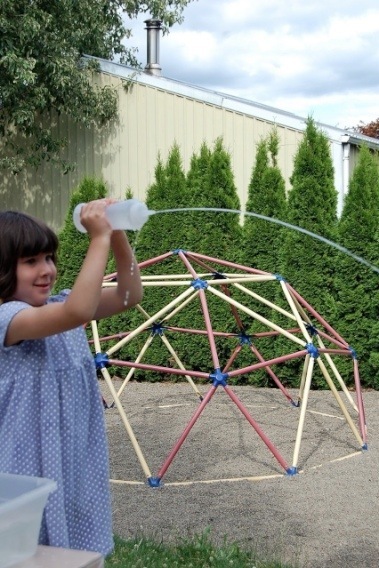 A soaker hose has been wound through the shrubs, tree, and over the playhouse to create “rain” on hot summer days. The kids decided filling their measuring cups from the “rain” was ideal. 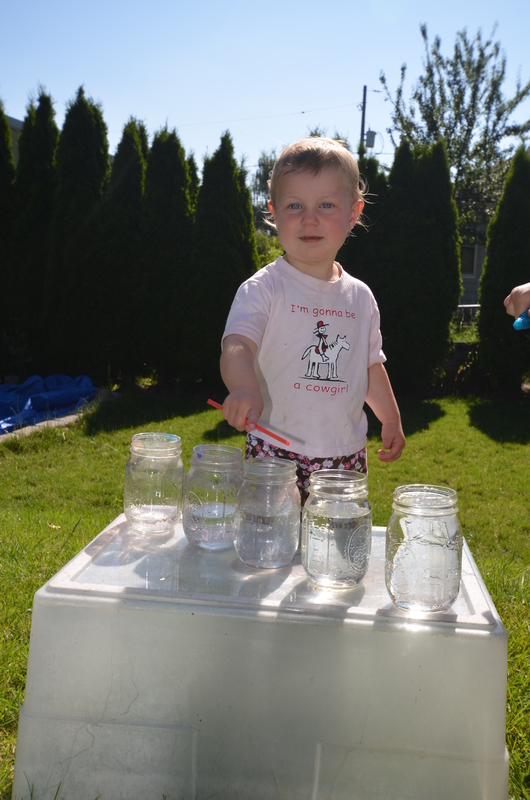 We’ll continue to experiment and compare other things this week. 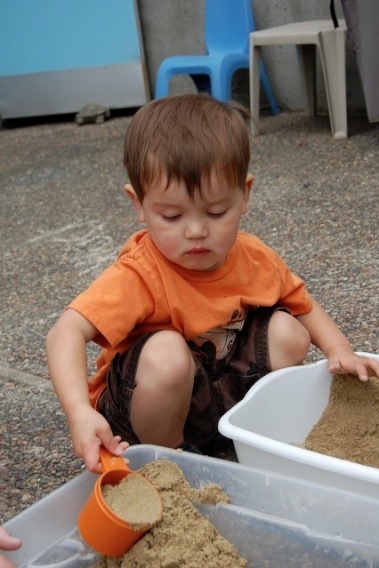 We’ll look at wet and dry sand, water and sand, water and river pebbles, sand and pebbles and whatever else the kids want to weigh. Today acrylic mirrors were added to the water tubs for the children to explore. 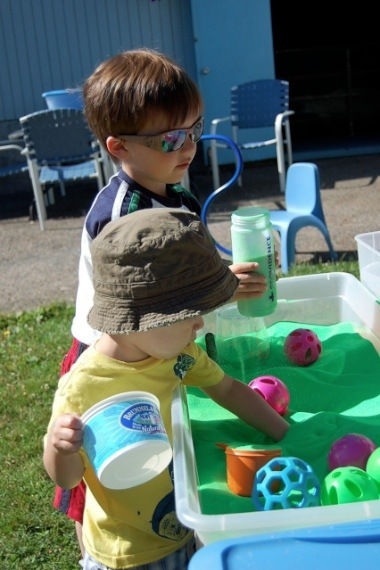 The children enjoyed looking at and playing with their own reflections as well as that of the objects they were playing with. 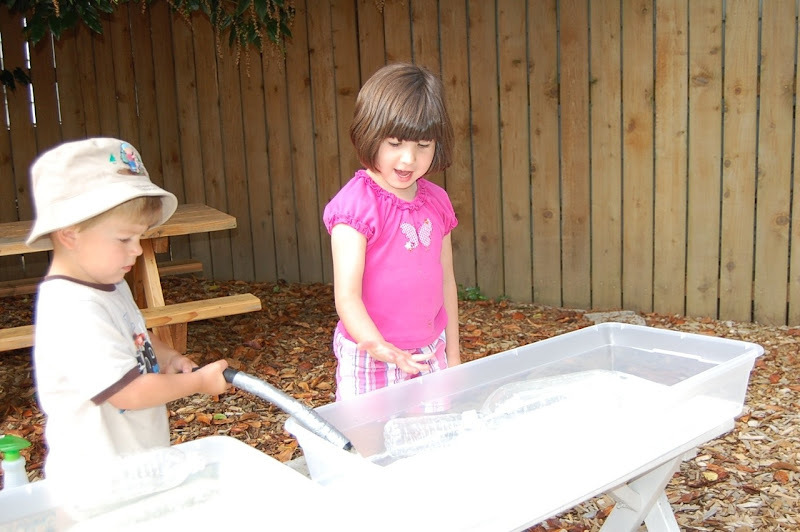 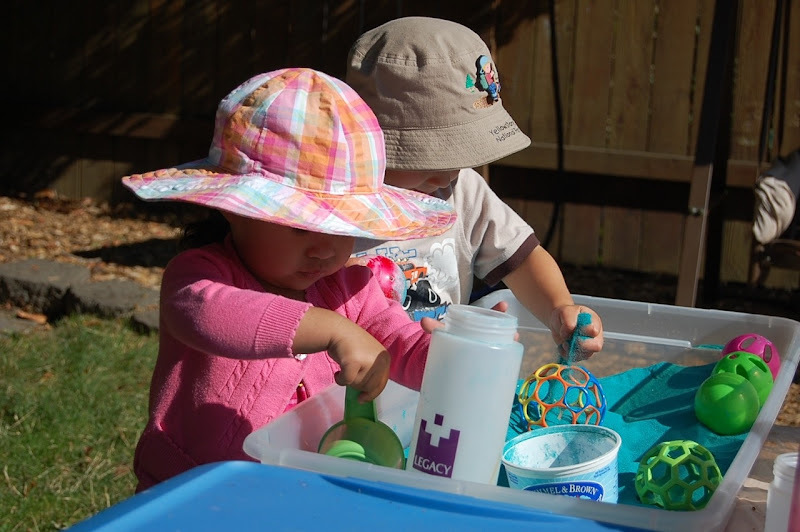 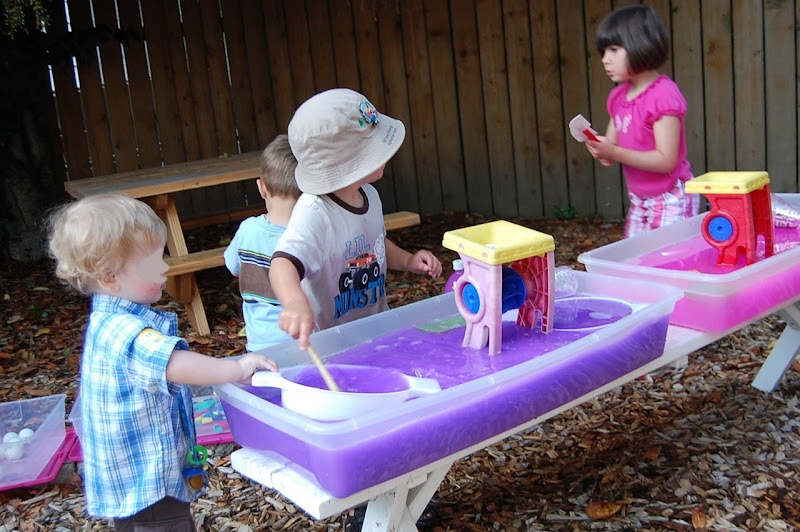 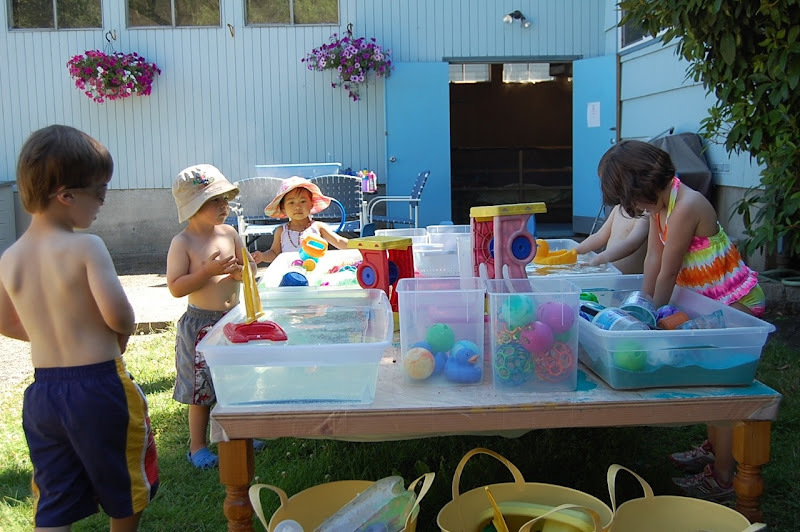 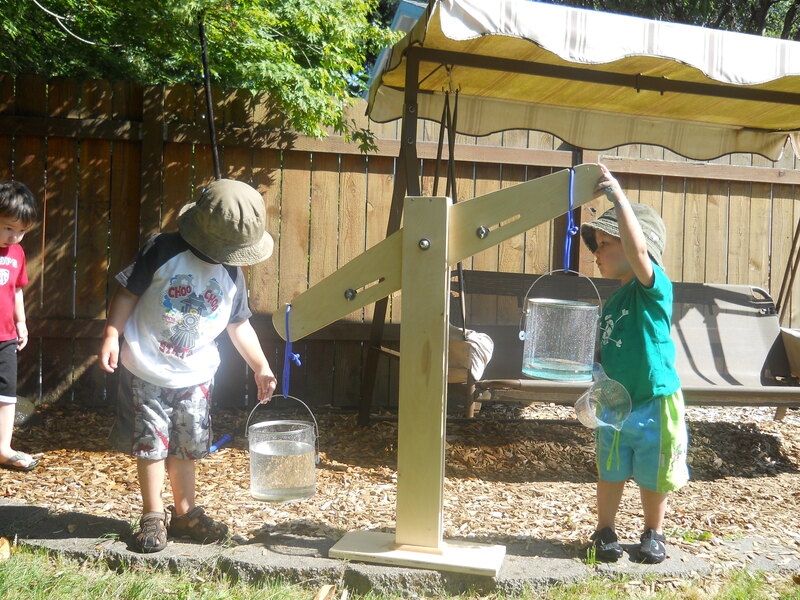 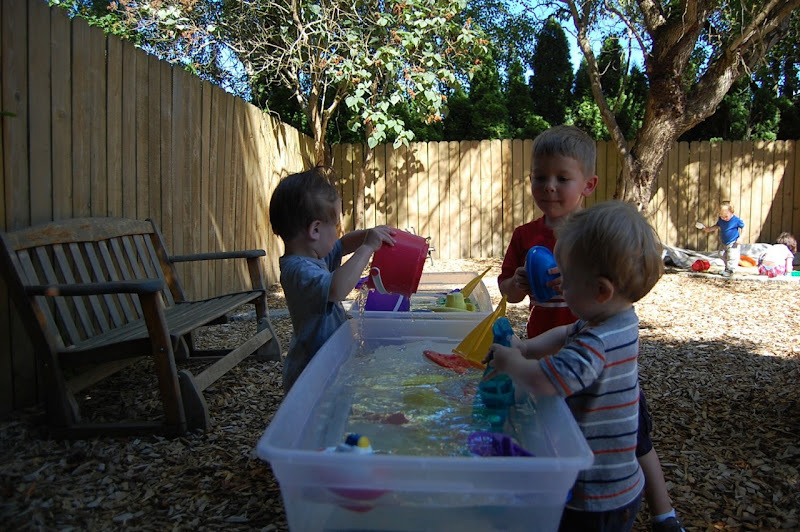 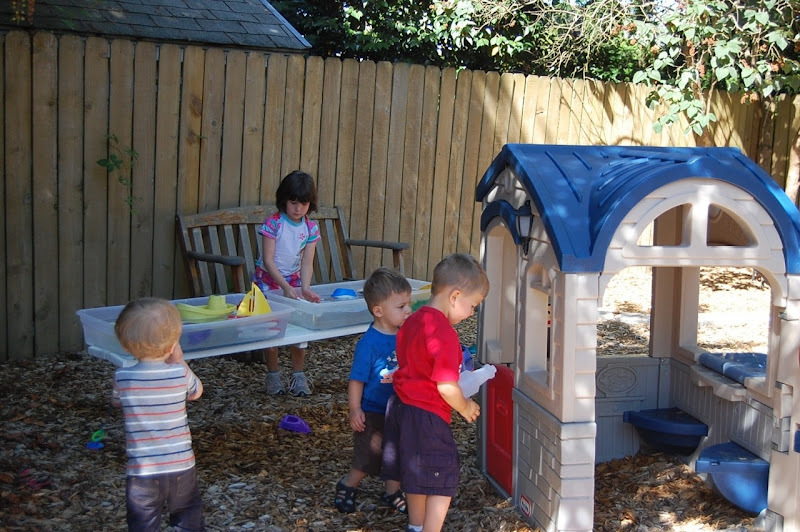 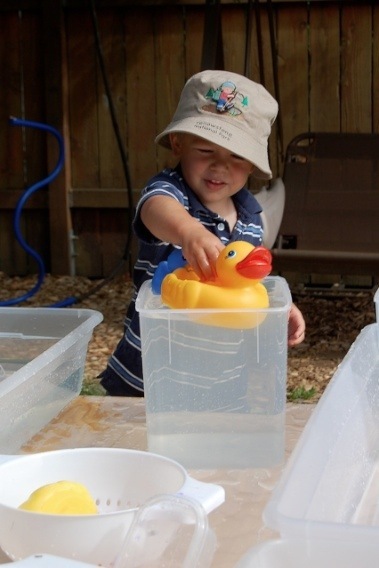 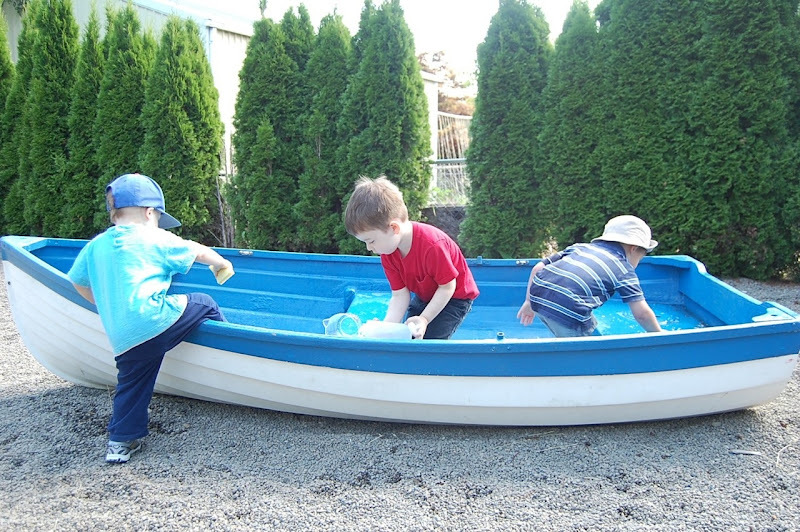 Water play was extended to washing the playhouse as well as mixng sand and water in the sand box. 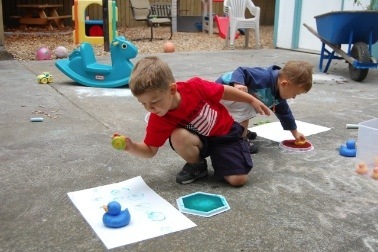 The children continued working with the ducks from yesterday. They used the rubber ducks as stamps and made prints on paper. 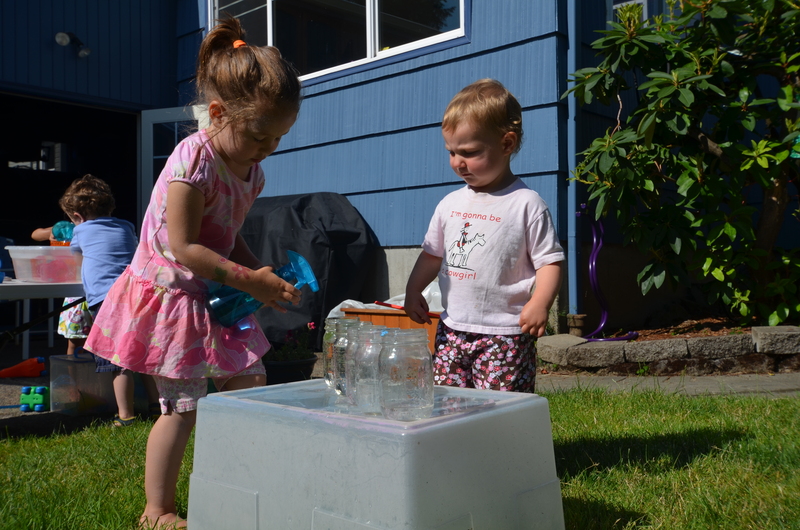 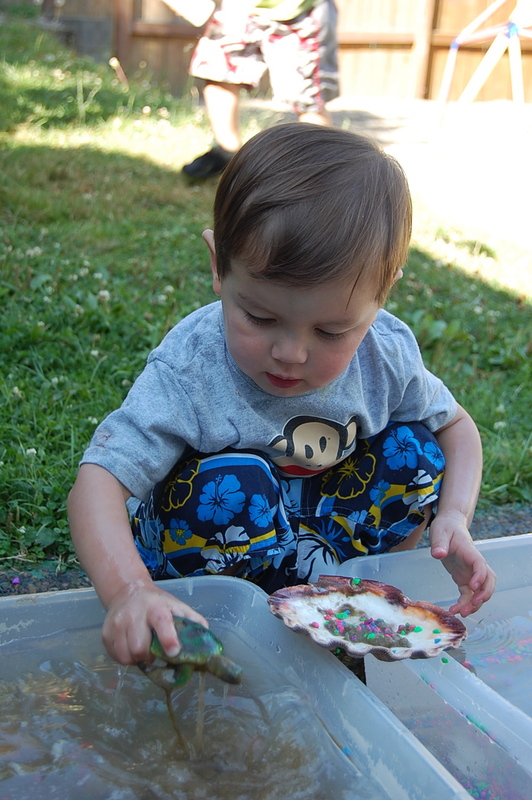 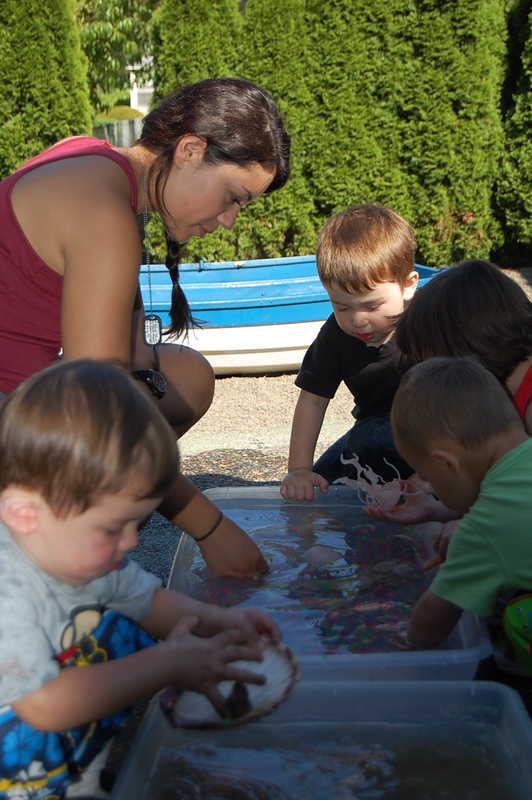 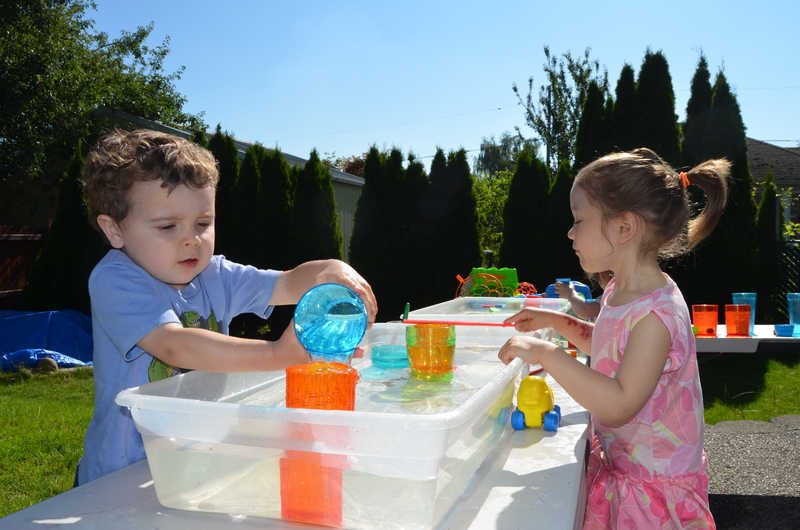 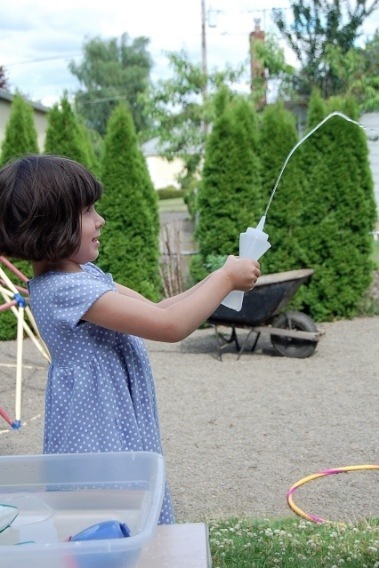 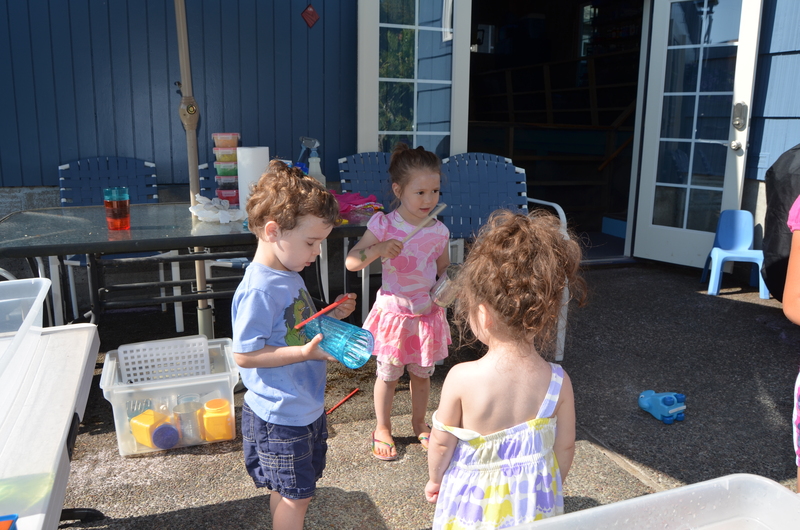 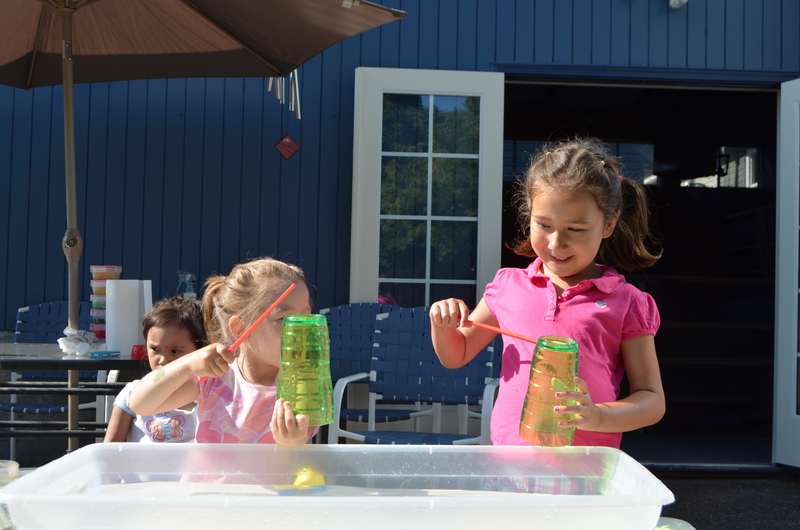 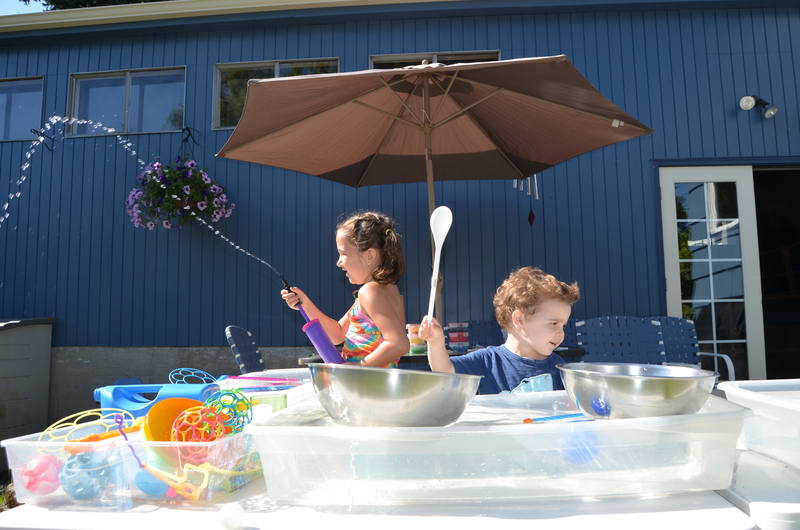 Our water play continues and today the children began exploring colored water. 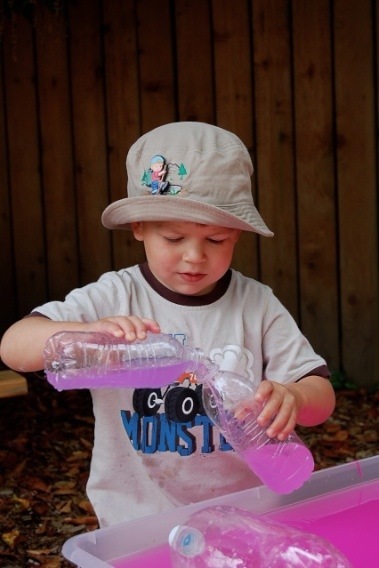 They chose to make pink and purple water. 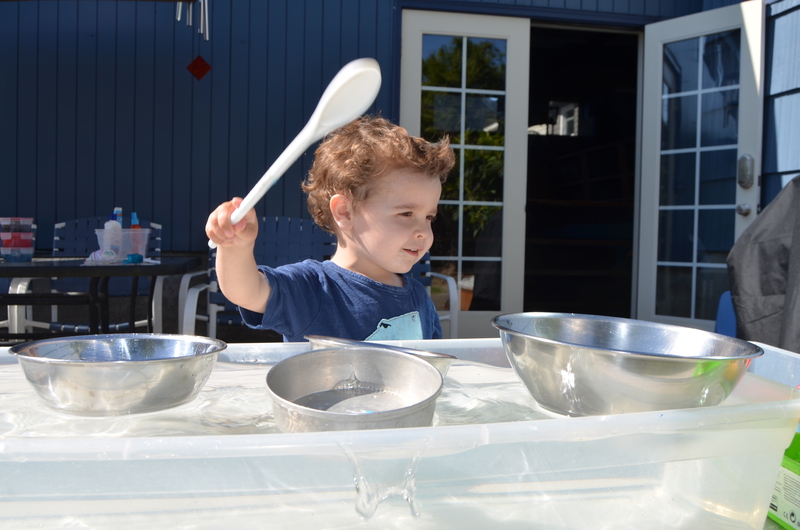 They poured water into the tubs. Pink and purple tempera paints were added to the water. 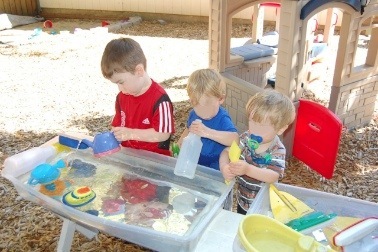 After coloring the water they began playing with bottles and mixing colors together. 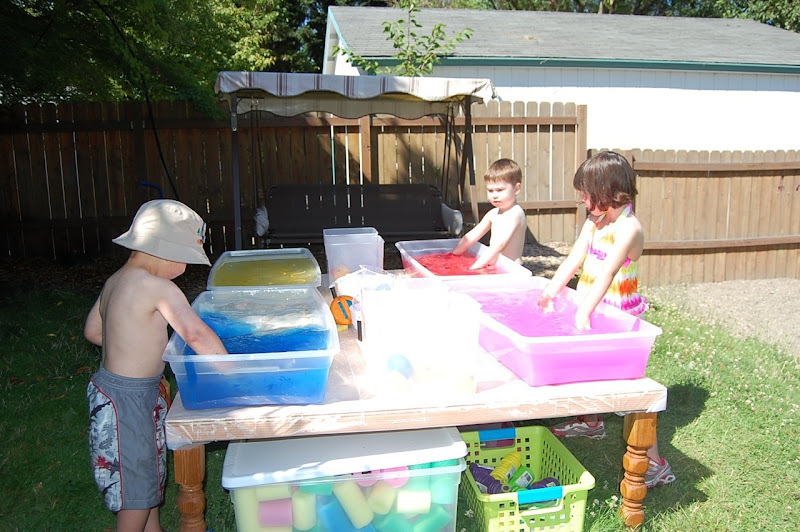 It took some time for the children to mix the water and paint, but the end result was very vibrant colors which the children enjoyed playing in. Tomorrow we’ll try some other colors.